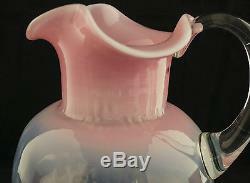 Gorgeous Antique Victorian Phoenix Webb Pink Opalescent Water Pitcher. This is a gorgeous late 19th century guaranteed to be old Victorian era hand blown with polished pontil pink opalescent large water pitcher with four matching tumblers. 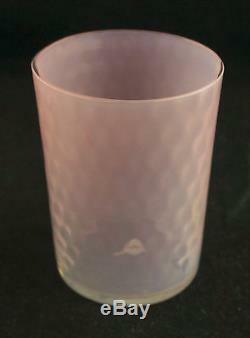 According to my research they were produced by American Phoenix Glass Co. Or British Webb Glass Co. 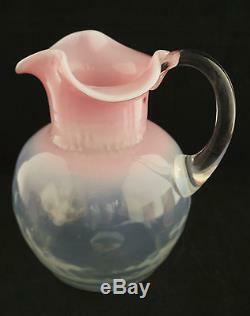 The pitcher has ball shape body with diamond optic pattern. 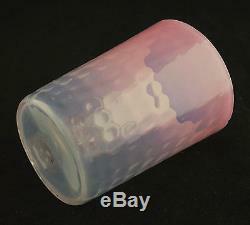 Color is clear opalescent which shades to magnificent pink. It has scalloped rim with French opalescent rim. Handle is clear crystal and applied. It measures 7.5" spout to handle, about 6.5" diameter at widest point and it is 8.5 tall. It is in excellent condition without chips, cracks or repair. 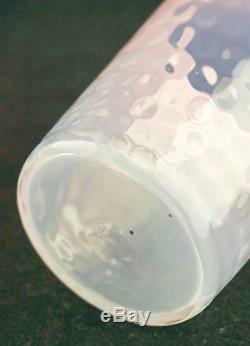 It has one ash particle just below where handle meets the body. 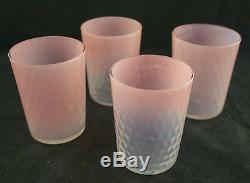 Four matching tumblers are all hand blown, all have polished pontil, they have diamond optic pattern and color is pink opalescent. They have 2.75" diameter, 3 5/8" tall, there of them are perfect, one has two flat already grounded fleabites outside of the rim. Discounts will be given only if items can be combined safely in the same box. Your satisfaction is very important to us. 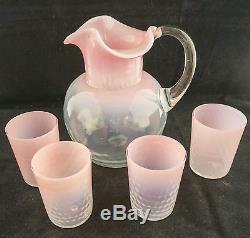 The item "Gorgeous Antique Victorian Phoenix Webb Pink Opalescent Water Pitcher 4 Tumblers" is in sale since Thursday, April 07, 2016. This item is in the category "Pottery & Glass\Glass\Art Glass\North American\Phoenix/Consolidated". The seller is "fayes" and is located in Alexandria, Virginia. This item can be shipped worldwide.